This is exactly the kind of hard-hitting investigative reporting that caused me to cancel my Popular Science subscription. A little sad when you know that a subscription to this magazine has been coming to my address for three generations and well over 100 years. Oz as he appeared when we tried him. First show, Silverwood in May 2010. Second show, SLADS in June 2010. Oz's last PSG with me. Eventually, if we loved the one we lost enough, the joy their life brought into ours will outlive the pain of them being removed from our lives. Until that day comes though, we grieve. We mourn for ourselves, for our loss, as we are the most selfish creatures on earth. We bend the world to our needs and whims with little thought to the cost. We make a memorial for a beloved horse about ourselves. And we are rarely content for long. We love animals for a multitude of reasons, not the least of which being that we get to see in them the opposite of our own selfish nature. The ideal human, free of selfish sin, may not be human at all. I first met Oz in Germany while looking for a horse for Kate at the home of Johannes Westendarp a very hard working, talented trainer. Johannes, along with his wife Ines and children, had taken his third generation family farm and transformed it from a cattle, chicken, sheep, and swine operation into a dressage-only breeding and training operation. I immediately liked him and could relate. He mounted Oz, then only known as Greystoke, on the cross ties and rode up the paved hill in the rain to his indoor arena. I remember liking the horse but being concerned with his obviously tenuous connection and thinking that he had gotten by on his good looks. The young stallion prospect we had looked at immediately before at Johnannes’ was more impressive to me and I thought, being the good, selfish human I am, a better choice as I’d get to ride the stallion more than this grey horse. I remain grateful for how wrong I was. The ugly, self-centered qualities of humanity also make us admirable. Because we’re never satisfied, we’re always striving for better. That constant striving pushes us forward. But that same striving quality prevents us from seeing the good we have until its time has already passed us by. Ten days after my first show with Oz, we went to Devon exactly seven years ago last week. He did very well, but after his classes there was a small hiccup. I remember being asked to leave the unoccupied stallion-only warm up area. I remember the asphalt. I remember asking Kate if Oz was O.K. I remember being stuck in a loop where I knew Kate was lying to me, but I was not able to say that, only able to repeat the question. After that Oz had a little time being a horse for James Shriver, our cowboy who first backs the youngsters. Oz got to herd cattle in a western saddle and an English bridle, got to climb the hill of dirt where our outdoor arena now stands, got used to traffic, and enjoyed it all, eventually. We often see clearly in loss what we couldn’t see in having. I think that is why death is such a rattling event. It shakes us from our self-centeredness and thrusts upon us, in an instant, a flooding upheaval of emotion: shock at change, despair at helplessness, sadness at sudden loss, failure for not doing more, guilt for not loving enough, guilt for not being grateful enough, left only with the cold loneliness. No matter how many surround you, no matter how many know and share in your pain, you are alone. No one but you knows exactly your grief, no one but you knows exactly your loss. Until thoughts clear and a little distance sets in, even you, your self, won’t know. You are now the last one on earth who was there when it was just the two of you. Things said or unsaid in a quiet moment together are now only yours to remember. The winter after Devon brought some new hardware in my shoulder and gave me a full-time new horse. The next several show seasons were building ones, learning how to properly prepare Oz in different show environments, learning to get him out before we left for the show, learning to ride him multiple times at the show, both when it was quiet and when it was busy. Scores ranged from mid 60’s to just over 80% in the 68 tests we showed. I’ve only ever shown one horse more than that. At the inaugural National Championships in 2013, our small warm-up on the cold, windy hillside was shared with a big moving, loud horse wearing floppy bell boots. Several times Kate had to leave the warm-up, having flashbacks of our Devon experience. We discovered Oz didn’t like floppy bell boots and went into our test after 50 minutes of warm up (our second or third of the day) and doing our first canter going around the ring. I was approached by someone in the class afterwards who told me they didn’t think they had anything to worry about based on seeing our warm-up. Based on our warm-up, they didn’t. Having a friend who can’t speak is oftentimes the easiest friend to communicate with. It is far easier for things that don’t talk to not disappoint us and to not judge us. The words we put in their mouths will always be the right words we need to hear. In the fall of 2015 rumblings were made of a certain junior rider being interested in Oz. My first thought was, no, he’d kill her. That winter Jenna became the very proud owner of Oz. Through immense dedication Jenna and Oz gained an amazing partnership. Jenna took care of Oz, helping him through challenging situations, and Oz took care of Jenna, too. The pair rode down centerline in tests only 32 times. In their two years competing they were always at the top of the pack nationally and their first year internationally. Their last year together they showed the highest level I had shown him. 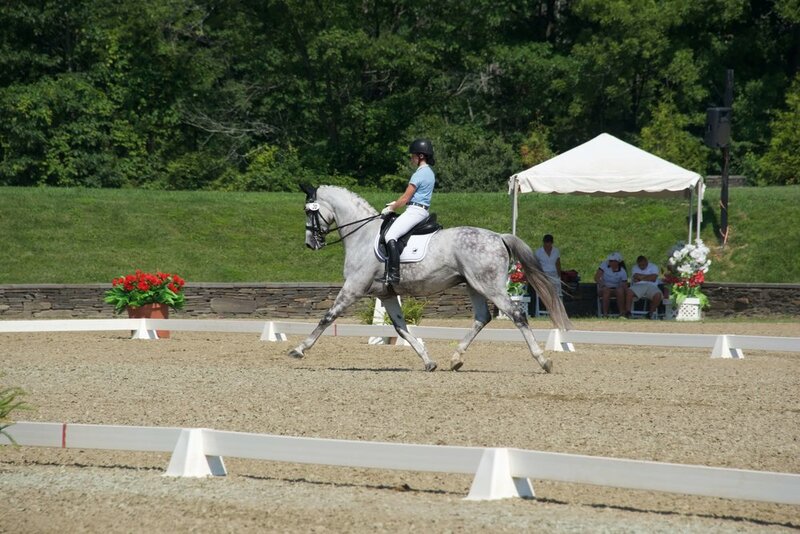 Their average across all their times down centerline at PSG was 5% higher than Oz and mine. I was proud. I was proud, when at the conclusion of their first year together, they won Juniors, clearly showing her riding as in a different league of understanding than the rest. 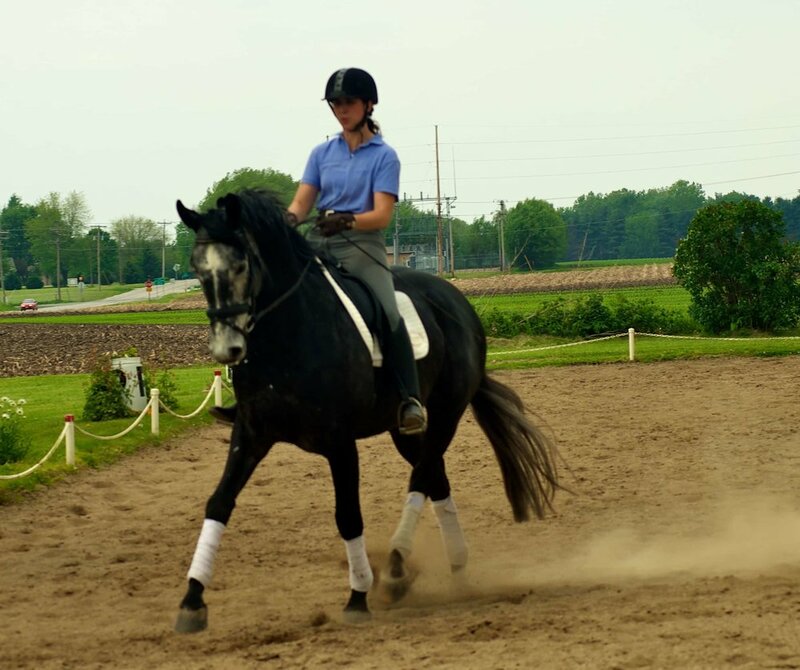 I was proud that a horse I’d trained had brought a rider along like Romulus had done for me. I was prouder still when we looked at the videos later, and she was embarrassed at the places she could’ve prepared better. 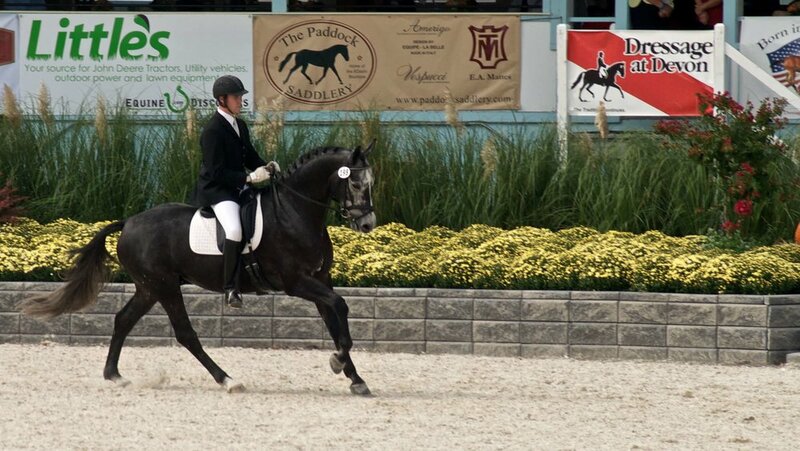 I was prouder yet when we did prepare better the next show season. The pair were able to do movements in the freestyle with technical difficulty I hadn’t seen any Young Rider perform since Romulus and I did. Always striving for better, wanting to do the best she could for her horse, striving for her self a distant third at best. Always kind on the ground, Oz became kind and even generous under saddle. In his kindness, Oz never let on to me that he had stopped being my horse sometime ago. Instead he had become Jenna’s horse, or perhaps more appropriately, Jenna had become his human. It showed in the stall, it showed on the cross-ties, it showed under saddle, every single day. All who knew Oz, for any amount of time, were touched by him, by his kindness, his soft, blinking, contented eyes. Grief is the price we pay for love, but for the love he gave in return, it’s a pittance to be certain and well worth the ride. RT @malcolm_kuhn: Daddy: You’re breathing pretty hard. Me: Yeah. Daddy: Why do you think you’re breathing so hard? Me: Cause I’m really, really big.